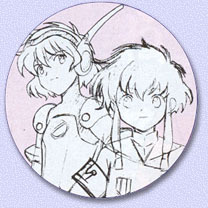 Misaki and Hikaru have come a long way since we last visited the world of Angelic Layer back in our February 2000 feature of the manga. We've learned a lot more about the nature of the media spectical known as Angelic Layer, seen ever increasingly more experienced dues and dolls, and even seen a few new mysteries crop up. But, it was only a matter of time before CLAMP's manga hit from Monthly Shonen Ace was turned into an animated series. Well, that time has come because "in the year 2001, Misaki & Hikaru will meet on TV!" 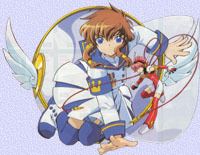 That's right Angelic Layer: Funny Little Battle Girl! will move from the print form into full-color anime from in the new TV Anime "Kidou Tenshi Angelic Layer" (Mobile Angel Angelic Layer). Planning for the project began late last year, but information about it's move to anime form didn't surface until January. One such announcement appeared in the January 2001 issue of Monthly Shonen Ace along with a pull out poster. 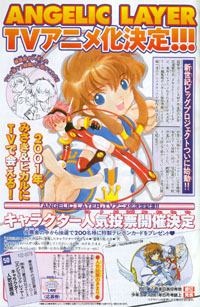 Other magazines such as have since run character sketches and some choice information. But, full details on how the manga and anime version will differ are still under raps. But expect all to become clear when the show premires on TV Tokyo on April 1 at 17:20. Yet, judging from the character drawings that have been released so far we can expect several of the characters to be a little older than their manga counterparts. The most startiling age differance is with Hatoko and Kotaru. In the manga Hatoko is five-years old, but in the anime she seems to be Misaki's age and she now has light-brown hair, thus loosing the resembliance she had to Card Captor Sakura's Tomoyo. At the same time, Kotaru is ten in the manga, but he looks to be in his teens in character designs. But, these age differances seem to be linked to the new title for the show, Kidou Tenshi Angelic Layer, which means that the show may be set farther in the future than the manga is. 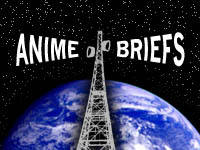 Right now the best place to go for true news is Clamp-Net's own Angelic Layer news page. But, there are a number of English sites dedicated to Angelic Layer that are excellent sources of new Angelic Layer info. TT's Angelic Layer Arena and Tsuko's AL Site are two of the most updated, but there are a number of others and the list is growing all the time. The quirky Parappa and his crew started out life as a game for the Playstation. Released November of 1997, the game featured our paper thin puppy protagonist, Parappa, rapping through various episodes to eventually win the love of Sunny Funny. In the game players had to "rap" with Parappa as he competes with the game's masters, by pressing buttons as he hits his rhymes. The game's catchy tunes (I can still recite Master Fleaswallow's song), humorous visual jokes, and bizarre paper cut out graphics caught the attention of many gamers, who propelled Parappa to the status of sleeper hit. The game has served as the impetus for the glut of rhythm games out today. In fact, Kaz Hirai, president of Sony North America, referred to Parappa The Rapper as the Playstation at its best. Parappa the Rapper was succeeded by Um Jammer Lammy in August of 1999. Instead of starring Parappa, Um Jammer introduced a new character, Lammy, (surprise, surprise) a lamb, and her band, Milkcan (interesting side note, bass and vocals for the band are done by Katy Kat, one of Parappa's friends in his game). Instead of singing along, the player and Lammy played the guitar for the band. Um Jammer Lammy failed to capture the attention Parappa did. It wasn't nearly as original as Parappa the Rapper, though it took it's predecessor's formula and bettered it, with remixes and a two player mode. The worst aspect of the game, however, were the songs - they simple were not as catchy as Parappa's raps. Needless to say, although Um Jammer Lammy was critically well received, it did not do as well as Parappa. However, our little friend continues on, as a Playstation 2 game by Nana On-Sha's has been announced. No specific details are known, but the game is scheduled to ship this summer. Why the history lesson? Because Fuji TV has announced Parappa anime, premiering in April. Details on the show are slim - it's not even sure whether or not characters like Lammy will appear. It's going to get a prime time slot. This may seem a little odd, but Parappa's a bigger gaming icon in Japan than he is in the states (he's most definitely one of the Playstation's mascots in Japan). Will it becoming stateside? No doubt the series will see an Internet debut shortly after it's Japanese one, thanks to American interest. But will it be licensed? In the words of Parappa himself, you gotta believe!